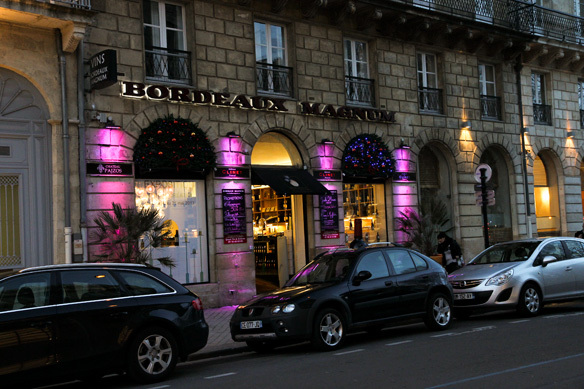 Persuaded by my Bordeaux insider, I attended a Food and Wine event at Bordeaux Magnum yesterday. Having forgotten about the French punctuality, I got there on time and had to pass an awkward half-hour amongst strangers, making small talks with my poor French but mostly reading wine bottles until all attendees arrived. While waiting, I sipped a Sauvignon Blanc based white wine from Bordeaux, which was quite pleasant to drink but wasn’t for my liking, perhaps because of the cooked pear and caramel taste, which is the characteristics of Semillion. Finally, the event kicked off, and the first bottle of the evening was served, following welcome greetings and introduction by the organiser about Garage Wine, which was the theme of the evening. Garage wine reflects a new way of winemaking by independent winemakers using modern and innovative, often organic or biodynamic technique to create wines in new styles to meet the changing trends and demands in the wine market. So these were the 5 bottles we tasted, and one is missing in the picture because it had already been served, which was Chateau D’Aiguilhe 2007. I didn’t like it very much because even though its intense dark fruit flavours and smooth tannin were agreeable, the taste was quite young and aggressive with not so much complexity. However, the 2008 was surprisingly good, smoky and luscious with blackcurrant flavour and floral notes, which reminded me of an Australian blend with Petit Verdot. And I heard Petit Verdot being mentioned in the explanation. I might have misunderstood it but I asked two young French guys next to me and they proved me right. Well, I will have to check it again later. The next one to try was Clos de l’Oratoire Grand Cru Classe, which was closer to the traditional St-Emillion style, dark and fruity with a full mouth feel. I would be interested to taste it 10 years later, but the 2010 was too young. 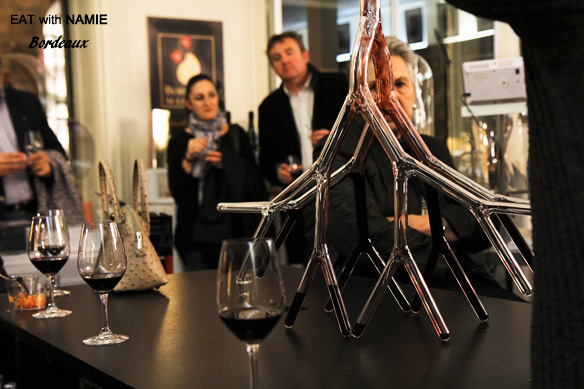 Wines were poured into many different kinds of decanter and it was quite a show. I’m not sure about the philosophy behind the strange shapes. What was the most interesting was a wine breather you see in the middle. I tasted wine, first through the breather and then straight from the bottle, and I preferred the one which didn’t go through the breather. The French people I talked with also preferred it natural and they also said that young people want wines that fit any occasions and meals. Five different types of finger food prepared by a chef from the highly reputable restaurant, L’Oiseau Bleu went around for each wine and I was a bit puzzled by the food pairings such as salmon tartar and deep dried oyster with red wine. 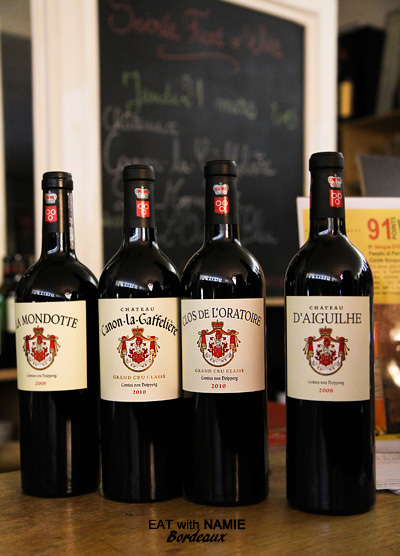 It proved itself that Bordeaux is the region of red wine indeed and people drink red wine with everything! The next wine to taste was Château Canon-La-Gaffelière Gran Cru Classe, and it was my favourite after La Mondotte 2006. The rich perfume of black forest fruit and violet in Canon-la-Gaffelière grabbed me immediately and though the tannin was quite chewy, it was in harmony with all other elements. I think its unique flavour is due to the high percentage, 40% of Cabernet Franc. By that time, I noticed that all of the wines displayed high alcohol content of 14%. I took this shot to show how much sediment was in the bottle, but it is not visible unfortunately. Our final wine, La Mondotte, was poured from the strange decanters and I could hear people murmuring in admiration. The impressed French guys, with whom I got friendly and talked throughout the event asked for my opinion on the wine, and I hesitated a bit to give positive answers. It was one powerful and well-structured wine but I said spontaneously to the people that something was missing on the middle palate, and when I said it, I had no idea what I was saying. However, one thing I remember vividly is the long velvety and delicious finish, which was very very impressive. 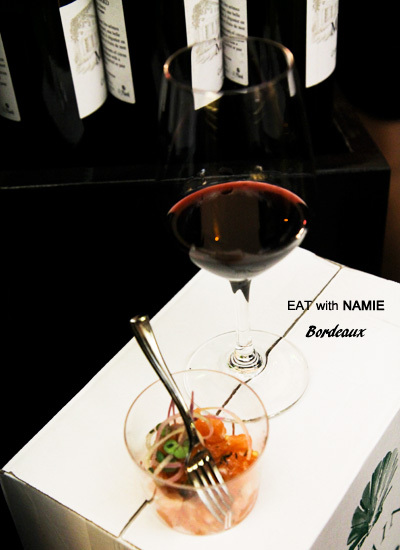 So the overall experience of wine tasting at Bordeaux Magnum was positive; I talked to people, practiced my French and tasted great wines that I wouldn’t have had otherwise, but the food served that evening wasn’t the best. I didn’t finish most of the food and I left the venue feeling hungry. I was surprised how long the session went on and it was almost 11pm and one of the few places that were still open at that hour was Regent, so I went there for duck steak and frites. Today I am off to the Médoc for more wine tasting. Oh, la la, quelle joie de vivre, huh? Looks like you attended a presentation of fancy decanters – wish you were more impressed with wines – while I understand that Bordeaux is changing style for the young wines be more approachable, they still need to age… I think it would be a lot more fun if they would server wines in the 1995 – 2003 range. Yes, I agree! I thought it was a bit of gimmick. I’m more interested in how the same bottle develops in the taste over time. Luckily, this weekend I got to test that and it was interesting. Last night I drank a 2003 and was taken aback by the high acidity at first, but after an hour, it was GREAT and it got better and better.